MINNEAPOLIS — The University of Minnesota has suspended 10 football players indefinitely from all team activities. Lee Hutton, a lawyer representing several of the players, tells the Minneapolis Star Tribune that that the suspensions stem from an internal university investigation into an incident on Sept. 2, hours after the season began. The unspecified incident also led to a police investigation, as well as a restraining order filed by a woman the paper reports is part of the team’s game day operations against defensive backs Ray Buford, KiAnte Hardin, Dior Johnson, defensive lineman Tamarion Johnson, and running back Carlton Djam. for an unspecified violation of team rules, but reinstated after Hennepin County prosecutors declined to press charges in the case. 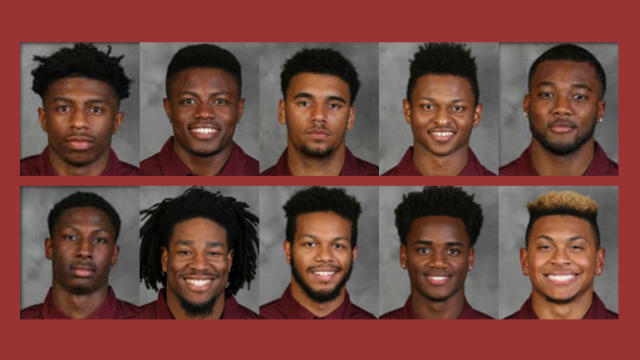 However, on Tuesday night, the school announced that the four players had been suspended again, along with Djam, defensive backs Antonio Shenault and Antoine Winfield Jr., running back Kobe McCrary, and quarterbacks Seth Green and Mark Williams. The school cites “privacy restrictions relating to student educational data” in withholding further comment.